Based on reviews from 37 experts and 6,022 users. Learn how our rankings work or see our guide to Adidas Predator football boots. Updated Apr 2019. A long-standing history is inevitable with such an influential line as the Adidas Predator. Since its first release in 1994, the shoe has gone through several modifications with each one made to make the experience of wearing Adidas Predator football boots better. Created with ball control in mind, the Adidas Predator football boots not only came up with innovative ideas in shoe construction but has made a name for itself as one of the most iconic silos from the Three Stripes. While great ideas are as elusive as unicorns, Craig Johnston was able to capture one and make his into a reality when he thought of the concept behind the Adidas Predator football boots. The Australian footballer jumpstarted the silo when he thought of incorporating synthetic materials in the upper to promote ball control. Since then, the cleat has been making history with much-anticipated releases. While the brand did decide for a time that Adidas Predator collection should be put on hiatus, it hasn’t stopped the iconic line from making a big comeback in 2017, much to the relief of its avid supporters. 1994 Predator. 1994 was a historic year for Adidas when they released the very first Adidas Predator football boot. Not just engineered for performance, the Adidas Predator football boot was able to deliver a menacing look with a black and red colorway on the pitch, blurring the lines between fashion and performance. Zooming in on the promotion of ball control, the kangaroo leather upper is peppered with synthetic elements or rubber teeth which was a first during its time. While not the lightest boot on the pitch, the Adidas Predator delivered power for players. 1995 Predator Rapier. The Adidas Rapier quickly followed suit and was released in 1995. The launch presented the brand an opportunity to explore a slightly different construction and colorway for the Adidas Predator line. In this model’s case, the Adidas Predator Rapier was released in several colorways including a white and red colorway on a limited edition basis. The tongue on this model is also much larger. Standing as the only Adidas Predator football boot to be released outside of a European championship and World Cup, it still managed to make a splash on the market. Updates on the shoe construction included less pronounced synthetic teeth in the strike zone as well as more areas made from kangaroo leather. 1996 Predator Touch. An opportune moment seized by the three stripes to unveil several design innovations is the launching of the then-new Adidas Predator Touch. This was the first time Traxion studs in the soleplate are used. These studs are more triangular in construction and, anatomically followed the contours of the player’s foot. While trying to promote this new feature, the brand also understood that more traditional players would prefer the more traditional outsoles. Adidas took care of this by making them available, as well. A small update in the tongue area can also be seen in this Adidas Predator football boot model. The change was made to create a cleaner strike zone. Other than the innovations introduced through this football boot, another historic event revolving around this shoe is David Beckham’s unbelievable halfway line kick during the Manchester United vs. Wimbledon game. When he made the shot, the legendary footballer was wearing his own pair of Adidas Predator Touch football boots. 1998 Predator Accelerator. You’d know that a football boot is quite special when a shoe is the dubbed, arguably to be the best football boots ever. That’s how the 1998 Adidas Predator Accelerator is described by quite a number of players. Headlined by the well-known footballer, Zinédine Zidane, this cleat was worn by the French athlete when he stole the show during the match against Brazil and, his team keeping the trophy on home soil. An asymmetrical lacing system under an unmistakable kangaroo leather tongue with its elastic band are other features that made the collection stand out and, as unforgettable as it is. An upgraded version of the Traxion studs and a number of different colorways for this model are also made available. 2000 Predator Precision. David Beckham made football history moment again when he wore the Adidas Predator Precision during the 2000 UEFA European Football Championship. While his half-line kick in 1996 skyrocketed him to fame, this time, he re-established his dominance on the pitch when he scored the notorious free kick against Greece that sent his team to the World Cup. In this model, Adidas used interchangeable Traxion studs for the first time. The inclusion of Velcro into the tongue area to secure it in place is also apparent. 2002 Predator Mania. As iconic as the Adidas Predator line is, the Predator Mania is one unforgettable cleat. This Adidas Predator football boot had several colorways available including one that sported a stunning ‘Champagne Gold’ colorway. This classy cleat befits the foot of one football royalty such as David Beckham. And indeed this colorway was created for the English athlete in the 2002 World Cup held in South Korea and Japan. This was the first model to have the elastic band incorporated into the fold-over tongue, a feature most recognizable in Adidas Predator football boots. A remake of this well-loved football boot was made in 2017 with more lightweight construction for the modern player. 2004 Predator Pulse. The insole feature of the Adidas Predator Pulse was the highlight of the model when it was released for the 2004 European Championship in Portugal. Called the ‘PowerPulse’ sockliner, this technology essentially increases power when passing or shooting by relocating 40% of the materials at the front of the shoe. Continuing his association with Adidas Predator football boots, David Beckham wore this model together with the French footballer Zidane. In addition to this, a limited edition yin-yang release took place in collaboration with Beckham. The model only had 723 pairs made which is symbolic of the player’s number for Manchester United, seven and, twenty-three which was his squad number for Real Madrid. The pair was also inspired by yin-yang philosophy hence, the name. 2006 Predator Absolute. Launched in the 2006 World Cup held in Germany, the Adidas Predator Absolute had liquid elements in its construction. This is also the model where the brand decided to make interchangeable PowerPulse sockliners. Several color schemes are available with Zidane wearing the special white and gold pair for the year’s cup. Designed with an asymmetrical lacing system on a kangaroo leather upper, it brings soft and comfortable sensation to players. The PowerPulse technology has also been integrated into this model ensuring powerful strikes for players. 2007 Predator PowerSwerve. It’s understandable why the Adidas Predator PowerSwerve is dubbed by many to be the last true Predator. This football boot model was the last release that contained elements that the Predator line was known for; most notably, the fold-over tongue with the elastic band and kangaroo leather upper. The Smartfoam technology has been first introduced into this football boot instead of rubber strips commonly found on the upper of older Predator models. Another technology associated with this football boot is Adidas’ Dynamic Power Pulse system which makes use of encapsulated tungsten particles placed in the midsole that would shift to the toe when a shot is made, reinforcing weight and delivering power. 2010 Predator X. Unveiling a completely new look that barely resembles an Adidas Predator football boot, the Predator X was worn by several notable footballers including Steven Gerrard, Xavi, David Beckham and, a few several others. The brand stripped of the fold-over tongue of the Predator X model and replaced it with a burrito style one. The upper material has also been changed to Taurus leather which is processed calfskin leather as the three stripes believed that it promotes a better feel for the ball because of its thinner composition. 2011 Adipower Predator. The Powerspine technology found in the Adipower Predator was engineered to aid the player to create more powerful strikes. Another introduction is the Sprintframe outsole which is designed to keep the player’s foot close to the ground. Because of the overall construction of this model, the shoe is lighter, catering to a more modern audience. This is due to the use of more lightweight and modern materials. Additionally, a Super Light version of the boot has been released with a Sprintskin upper parallel to this model’s seemingly obvious focus on weight. 2012 Predator LZ. The Adidas Predator LZ or Adidas Predator Lethal Zones was all about a new concept. Adidas introduced five lethal zones that included key areas for touch, power, and control. The look of this model appealed to a more modern audience due to its look and construction. A Super Light version was made available which was combined with Sprintskin. 2013 Predator LZ II. Essentially an updated version of the Predator LZ, this second generation cleat underwent work with its strike zones, making them larger. 2017 Adidas Predator 18. The revival of the Adidas Predator football boot afforded Adidas to reimagine the iconic football boot in a modern way. Starting with the upper, instead of using leather, the Adidas Predator 18.1 and Adidas Predator 18+ models used a thinner ControlSkin upper with a Non Stop Grip feature that promotes ball control even in wet conditions. The outsole is created with Sprintframe technology that is composed of the Total Control stud arrangement which promotes superior traction, ease of turning and, stability. There are several take-down models that offer the bulk of what the premium ones have to offer. Take down models include Adidas Predator 18.2, Adidas Predator 18.3 as well as the Adidas Predator 18.3. 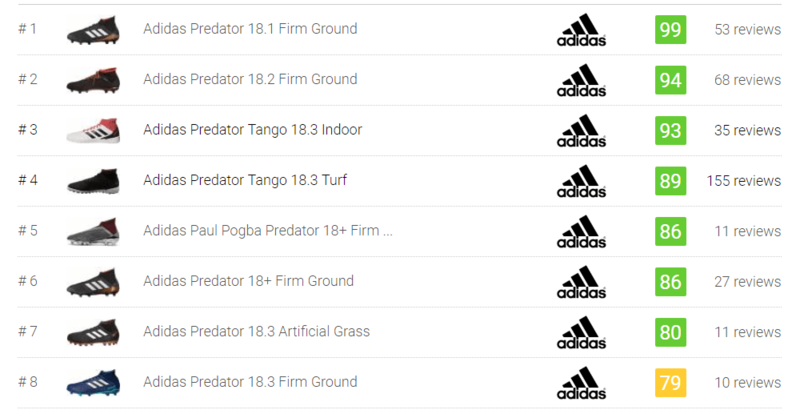 Models for different court types are also created including Adidas Predator 18.1 Artificial Grass, Adidas Predator 18.1 Soft Ground and, Adidas Predator 18.2 Firm Ground. Additionally, indoor versions are also produced which include Adidas Predator Tango 18.3 Trainers, Adidas Predator Tango 18.1 Trainers and, Adidas Predator Tango 18+ Trainers. Over the years, innovation has been widely associated with the release of Adidas Predator football boots. It seems that for every release, a Predator has something new to offer to its patrons. And through the years, the collection has accumulated quite a number of football boot technologies. Below are some of the most notable ones. The Power Pulse system contributed to the power aspect of Adidas Predator football boots. The construction involved putting 40% of the materials in the forefoot of the shoe creating a 3% increase in the kick which improves the swerve of the ball. The Adidas Power Pulse technology is highly apparent in the 2006 Adidas Predator Absolute release. It is a technology makes use of encapsulated tungsten particles placed on the base of the football boot which shifts from the midsole to the toe when a shot is made. The shift reinforces the player’s kick, making a more controlled strike. It is the technology that eventually replaced Power Pulse system. This was engineered to minimize energy loss in a shot by lessening the ‘kicking flex’ in the forefoot area. The Predator model with this feature is the Adipower Predator. It is a feature made of an injected silicone rubber that is placed into the base of the shoe. The Predator element has been engineered by the brand to bring ball control by maximizing ball spin even in wet conditions. The Adidas Predator football boot with this technology is the Adipower Predator released in 2011. Placed in the midfoot, this mechanism is designed to create a sturdy but lightweight support. The design is inspired by how bridges are made. The Sprintframe technology mimics its fluid design and how it supports enormous amounts of weight. While keeping the player’s foot close to the ground, this feature is often paired with a (PU) Polyurethane insole. The Adidas Predator football boot with this technology is the Adidas Predator 18+ and Adidas Predator 18.1. This feature is a stud pattern that uses triangular-shaped studs. The stud shape is created to aid turning and to maintain stability for players. This technology is also evident in the newly release Adidas Predator 18 football boots. Models with this stud pattern include Adidas Predator 18.3 Soft Ground and, the Adidas Predator 18.1 Soft Ground. Used on the upper of the Adidas Predator 18+ and Adidas Predator 18.1, this feature is used to maximize ball control even in wet conditions. While the new predator model got rid of the rubber elements, this more modern ingredient is one of its replacements. Most of the upper construction of the Adidas Predator football boots are dominantly built with kangaroo leather. This material is considered to be of premium quality as it is highly sought out for its softness and moldability, giving players an incredible personalized fit. This natural leather also brings comfortable fit fresh from the box and needs little to no break in period. The use of kangaroo leather for Adidas Predator football boots took a pause when the brand started using Taurus leather starting with their Predator X model. It was not until the revival of the silo did the brand incorporate kangaroo leather uppers into their Predator football boots again. Kangaroo leather has been used in the Adidas Predator football boots first release up until the 2007 release, Adidas Predator PowerSwerve. It wasn’t until the Adidas Predator line was re-released when Kangaroo leather was used in its models’ upper again. However, it was not for public consumption as they were custom made for the professional footballers. This material was first found in the upper of the 2009 release, the Predator X football boot. The material is essentially a full grain calfskin leather upper that was treated to make the material soft and weatherproof. The rubber elements incorporated into the upper is engineered to create better control of the ball. There have been several ways that the rubberized element has been incorporated into the football boot starting with rubber teeth for their first few releases. The more recent releases, however, particularly with the Predator 18 excluded this feature, incorporating an element with a much thinner composition. The elastic built into the fold-over tongue is also a common sight in Adidas Predator football boots. As the tongue of the Predator models come quite large, the elastic is an effective way of securing the tongue in place. The very first Adidas Predator football boot model with an elastic band incorporated into the tongue is the Adidas Predator Mania. While the classic Adidas Predator football boot is known for its red/ black/ white colorway, Adidas also tried a hand in choosing other color combinations for some of their recent releases. One the most notable releases that strayed away from the silo’s usual palette is the Adidas Predator X. The release had a yellow/ black colorway which was vastly different from the rest of the collection. Another is the LZ release which made use of a blue/ orange colorway. In the 2017 release, the Adidas Predator line went back to its roots by using a core black/ white/ real coral/ tactile gold metallic colorway during its launch. Other colorways including a blue/ turquoise was also made available in 2018. Adidas Predator models with this color palette is the Adidas Predator 18+ and Adidas Predator 18.1 as well as its takedown models including Predator 18.2 until the Adidas Predator 18.4. There have been several key players that the Adidas Predator silo is associated with. Perhaps one of the most noteworthy is its partnership with the celebrated footballer, David Beckham. The collaboration between the Predator silo and the athlete started when the then 21-year old footballer made a goal from the halfway line while wearing his Adidas Predator Touch in 1996. Since then, the athlete has made several collaborations with Adidas mostly for the Predator silo which included limited edition releases. Zinedine Zidane was one other who wore several Adidas Predator football boot models starting with the 1998 Predator Accelerator, Adidas Predator Mania, the 2004 Predator Pulse and Adidas Predator Absolute. Other notable athletes who sported the Adidas Predator football boots from the iconic silo is Xavi. He wore the Adidas Predator LZ when he dominated on the pitch garnering numerous La Liga titles, Champions Leagues awards as well as a couple of European Championships. While the old Predator boots were closely associated with power, the LZ model was a bit different as its emphasis was on speed and technique. The recently released Adidas Predator 18 has its roster of players who proudly sported it as well. One of the elite players who donned a pair of the laceless Adidas Predator 18+ is Paul Pogba. Other players who have worn their own pair of Preds are Dele Alli, Mezut Ozil and, Ivan Rakitic. The poster boys for the Adidas Predator 18.1 include Harry Winks, Ilkay Gundogan, and Nacho. Why was the Adidas Predator football line discontinued? Several factors lead to the discontinuation of the Adidas Predator line. Most theories point to the release of the Adidas LZ I because of how different this model is from the rest of the collection. Aside from the colorway that was vastly different from the rest of the line, the materials used and construction was just not that of Adidas Predator football boots, hence, losing the familiarity that they created with players loyal to the line. One football boot critic, however, begged to differ when he pointed out that the decline of the collection started with the Predator X release. Here’s his explanation: first is the Predator X’s upper material. While the Adidas Predator line is mostly known for its kangaroo leather upper, the Adidas Predator X used Taurus leather (which is basically treated calfskin leather). While Taurus leather has its benefits, kangaroo leather is still considered a superior material. Another factor is the release of the f15 Adizero. The brand went with a whole new direction when they released this model as it focused on thin and lightweight construction. It is a concept which is vastly different from what the Predator then stood for. While the Adidas Predator stood for power, the thin and light trend was what’s new and captured players then, and even until today. Why does the Adidas Predator 18 release look like an Ace? It was a bittersweet moment when Adidas announced that they will be discontinuing the Adidas Ace silo and, signaled the revival of a most beloved classic collection - the Adidas Predator. When the first revived Adidas Predator football boot was released, many have mentioned that the new model is an Ace boot dressed up as a Predator. True enough, there are similarities between the Ace and the comeback Predator model starting with the laceless upper, mid top construction and a knit material. According to Adidas’ VP of Design Sam Handy, in a way, the Ace collection springboarded the new Adidas Predator collection. The Ace collection gave Adidas a chance to experiment with new technology which would not have been possible to do with the Adidas Predator collection. After all, every Predator release brought with it an innovative technology during its time. The Ace silo afforded the three stripes with a much-needed break to reimagine the Predator in a much more modern light. Are there kangaroo leather versions of the Adidas Predator 18? Yes. The brand did create custom kangaroo leather Adidas Predator 18 football boots, but it was only limited to professional players of the game. Several players sponsored by Adidas including Nacho Fernandez, Mats Hummels, and Nemanja Matic sported kangaroo leather Adidas Predator football boots.